The sharpening method and the grindstone to be used differ according to the type of knife, so please be careful. 1. Completely immerse your sharpening stone in water for about 10 minutes so that the water can properly soak into them. 2. 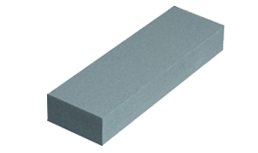 If the surface of a used sharpening stone is not flat, use a coarse stone to grind it flat again. 3. Place a towel or other suitable item under the sharpening stone so that it will not move when you sharpen your knife. Let's begin by sharpening the knife from the front side. Western knives are not evenly double-beveled. The ratio for sharpening them is 80% on the front side and 20% on the back side of the blade. (The angle of the blade to the sharpening stone surface is about 10 degrees.) All knives are sharpened from the cutting edge to the spine of the blade. You hold the handle with your right hand, push down on the side of the blade with the fingers of your left hand, and sharpen by moving the blade toward the center of the stone. Sharpen vegetable knives, Chinese knives, sushi knives and other double-beveled-blade knives on the front and back bevels with the angle between the blade surface and the stone of about 10 degrees. If the knife has layered in its blade, it is better to sharpen the side of the blade that has less of this steel exposed. Begin by sharpening the knife from the front side. Sharpening is completed when the knife has an even burr. Only use a flat-surfaced stone to finish the back surface of the blade. Sharpen the blade from the edge to the spine. Do not sharpen at too great an angle between the blade and the stone. The stone used to finish the cutting edge of the blade should contact the edge evenly. The mechanical qualities of the cutting blade are similar to those of a pencil lead. If the pencil is sharpened by cutting off very thin shavings, you will be able to write with a sharp point for a longer time, but the lead will easily break if you apply force to it (Fig. A). Fig. B shows the ideal shape for a blade edge. The blade profile has a slight curve. As shown, the way in which a blade cuts depends on whether or not it has been sharpened properly. Years ago, good natural stones were used, but these are rarer nowadays. Good natural stones can be incredibly expensive and very hard to obtain. There are many kinds of synthetic stones that are inexpensive and of good quality. 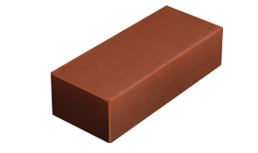 This grade of stone is for coarse sharpening and is used directly on the blade if the blade is nicked or rounded. Used in back-grinding of single-beveled blades such as sashimi knives, knives with thin blades, fuguhiki sashimi knives and eel-filleting knives. Carbon steel will rust if water drops, traces of cooking ingredients or other materials are left on it for a period of time. Reddish rust may penetrate into the blade. On the other hand, the surfaces of knives that have been looked after may blacken a little, but this is a different type of iron oxide than ordinary reddish rust. This black oxidation is mainly triiron tetraoxide (Fe3O4). It coats the surface of the metal and prevents ordinary rust from getting in. It will not discolor food and poses no threat to hygiene. The surface of these types of metal alloys will not discolor due to rust or other oxidation. These special alloys are different to carbon steel because they are metals that have an active-passive nature. Nevertheless, they can often rust—although you may not notice it. Food residue or water can allow rust to form in places where oxygen cannot easily reach. Rust can quickly penetrate near the blade tip, so wash your knife in a detergent solution after use, then dry it with a towel and store it in a dry place. 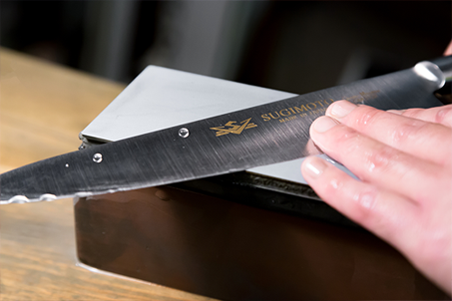 The blades of Sugimoto Hamono Japanese knives are tempered using the traditional mizu-yaki process which gives the metal a harder finish compared with Western knives. As a result, if you sharpen the cutting blade so that it becomes too thin, it will not be able to maintain its mechanical strength and may chip. 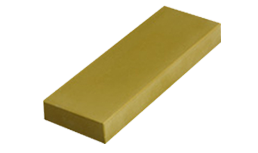 In addition, you need to use a flat-surface whetstone to back-grind a Japanese knife. Be careful not to over-grind the blade. Blades made using the hon-kasumi method consist of two different layers of metal that are forge-welded together. Since the blade is composed of two layers, it may slightly bend over time, but this can be corrected at our Company. Single-beveled-blade knives cut with the back side of their blade. Please take particular care that this back side does not become rusty. Sugimoto Hamono Western kitchen knives are made from carbon steel or special alloy steel. Although carbon steel knives cut well and are easy to sharpen, they rust easily. Carbon steel knives are also discolored by some foods, but this is not a problem with special alloy steel knives. The Western-style kitchen knife is often referred to as a “general-purpose knife” and is widely used.